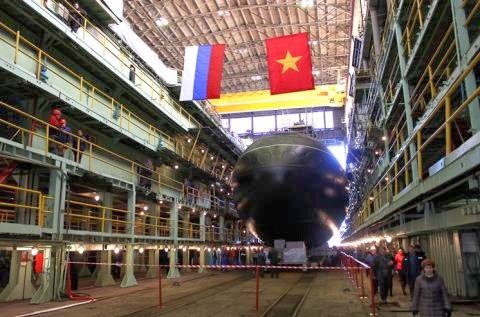 (VOV) - A Project 636 Varshavyanka-class diesel-electric submarine, HQ-185 Khanh Hoa, was floated out at St. Petersburg –based Admiralty Verfi shipyard on March 28. This is the fourth Project 636 submarine Russia has designed and built for Vietnam under a contract signed in 2009 during a Moscow visit by Prime Minister Nguyen Tan Dung. Under the contract, Russia will build six submarines, dubbed as Black Holes in the Ocean by NATO, and the first two vessels, HQ-182 Hanoi and HQ-183 Ho Chi Minh City, have been handed over to Vietnam. The third, HQ-184 Haiphong, is being given a test run at Admiralty Verfi shipyard, and is scheduled to be transported to the Vietnam People’s Navy this summer. Sources says the Varshavyanka-class (Project 636), an improved version of the Kilo-class submarines, features advanced stealth technology, extended combat range and provides the ability to strike land, surface and underwater targets. Designed for anti-ship and anti-submarine missions in relatively shallow waters, the submarines can cruise underwater at a speed of 20k and has a cruising range of 400 miles. PH Eyeing 3rd Hamilton Cutter from US?